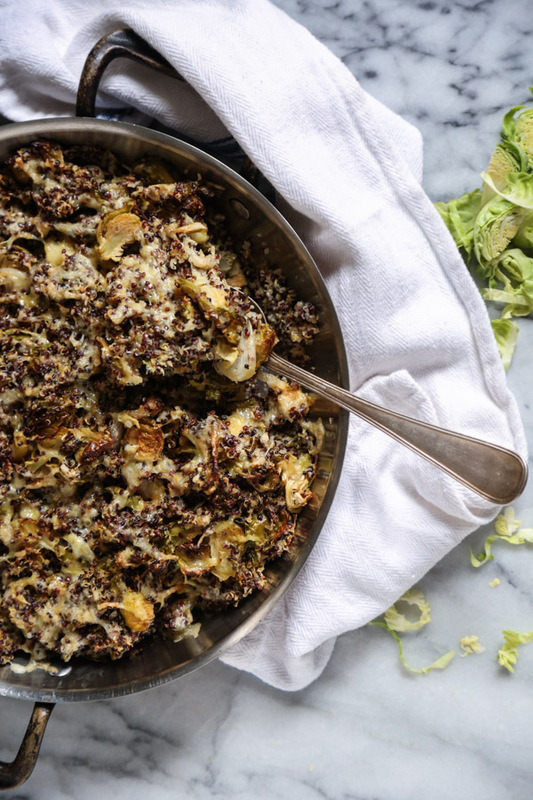 I made this quinoa and Brussels sprout gratin a few weeks ago to bring to the second installment of my #FriendsinFood potluck dinner series. 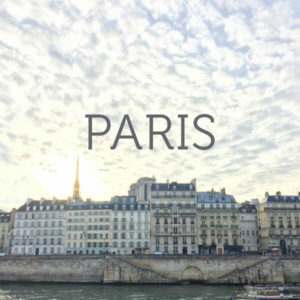 Even though I’ve been blogging since November 2008, when I started my first site, I’ve always felt a little on the fringe of the food blog community. Somehow I never got my act together to get involved in the conference circuit. And though I’ve made a lot of awesome virtual friends, for a while it seemed like I was the only one who didn’t have a dedicated posse on the ground to share cocktails and conversation about the ups and downs of making Thanksgiving stuffing in September and margaritas at 10am on a Monday. My resolution for 2015, which only took seven years to make, was to finally rally a New York food community. 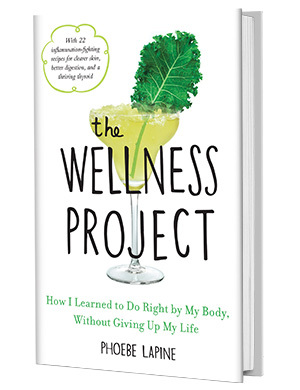 And now that the year is coming to a close, I’m happy to say that this promise, unlike many of my wellness-related ones, was a huge success. I’ve been incredibly fortunate to find some amazing women—Serena, Anna, Amie and Elisa—who were just as game to get all these makers around one table. And thus, #FriendsinFood was born. Our second gathering at the magical cafe Maman was filled to the brim with deliciousness and good company. And though I was secretly hoping that the table would end up covered in 10 different kinds of gluten-free pumpkin pie, the spread was perfectly diverse and included all the best harvest ingredients of the season. Andie Mitchell brought crostini with pumpkin cream, Jodi Moreno served delicious delicata squash, and Samantha Seneviratne rounded out the dessert table with a pear crumble tart, just to name a few of the tasty contributions. Luckily, I was the only person who used Brussels sprouts as the dish’s star. Perhaps it’s because I was never fully socialized sans keyboard during those early years of blogging, but I always get incredibly nervous cooking for my esteemed peers. 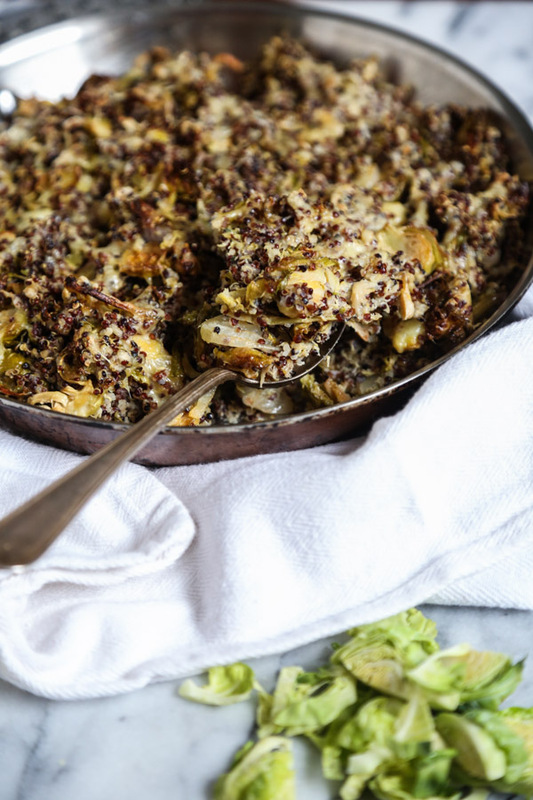 Instead of winging it with a completely new creation, I decided to swap Brussels for the broccoli in this quinoa gratin recipe that I developed for Food & Wine. It’s topped with a crack-like smoked cheddar that I got at the Farmer’s Market. And I’ve been eating waaaaay too many cheesy omelets with the leftover block. Heyho, sweater weather! 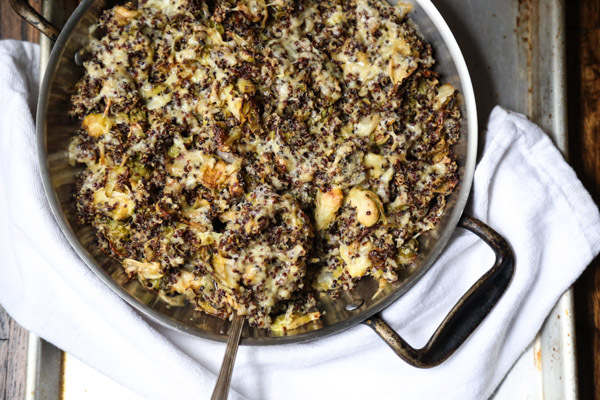 If you have some leftover quinoa and cheese you can sub in any roasted vegetable. 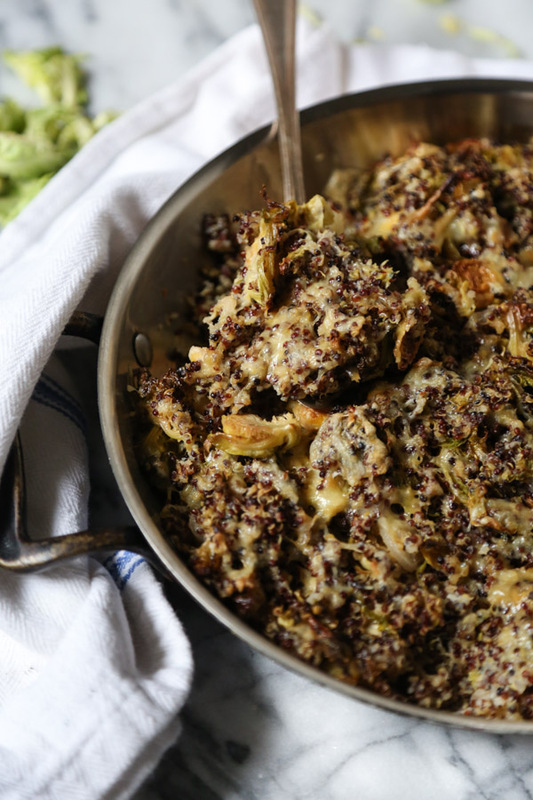 But I’m partial to serving Brussels sprout au gratin this time of year. 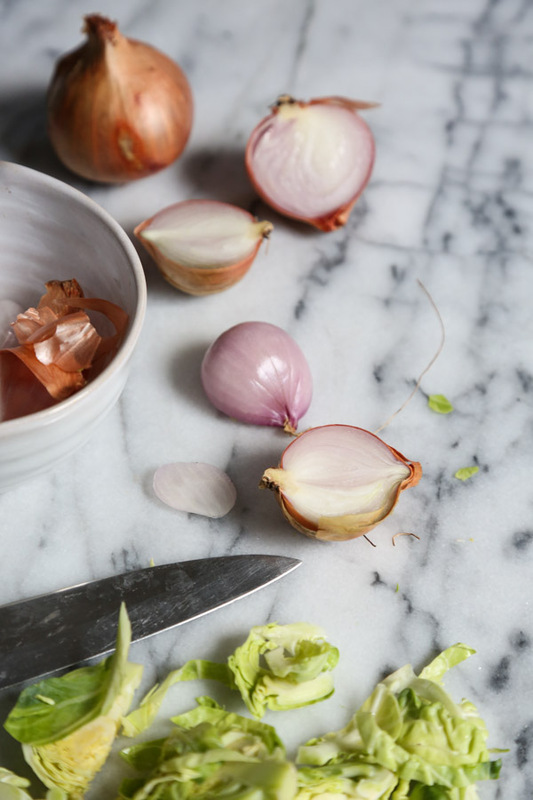 It would be a great gluten-free alternative to stuffing on your Thanksgiving table. Or an easy make-ahead side to woo your own #FriendsinFood from the neighborhood. In other news beyond my neighborhood, I’ve had the most amazing week down in Nicaragua!! I can’t wait to tell you about all the tasty things my friends in food at Maderas Village served up when I get back to town. 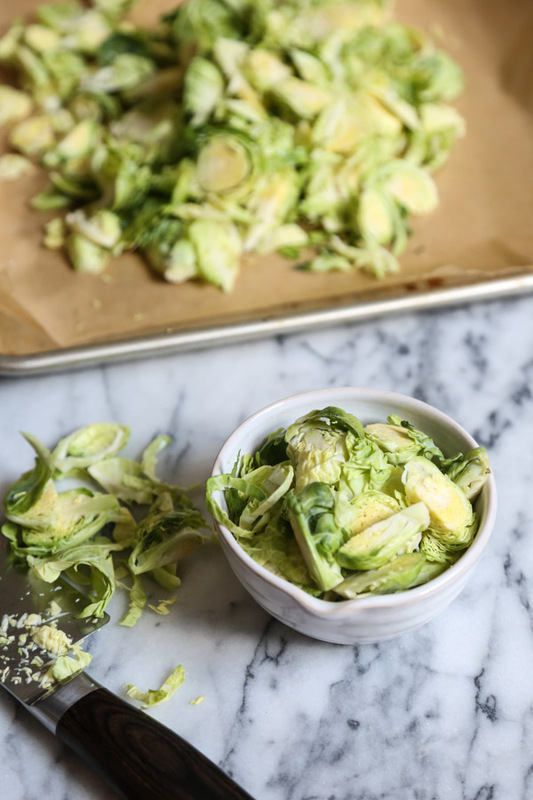 This Brussels Sprout au Gratin recipe couldn't be easier - you only need four ingredients, plus salt and olive oil! Preheat the oven to 400°. Grease a large cast-iron skillet or casserole dish and set aside. 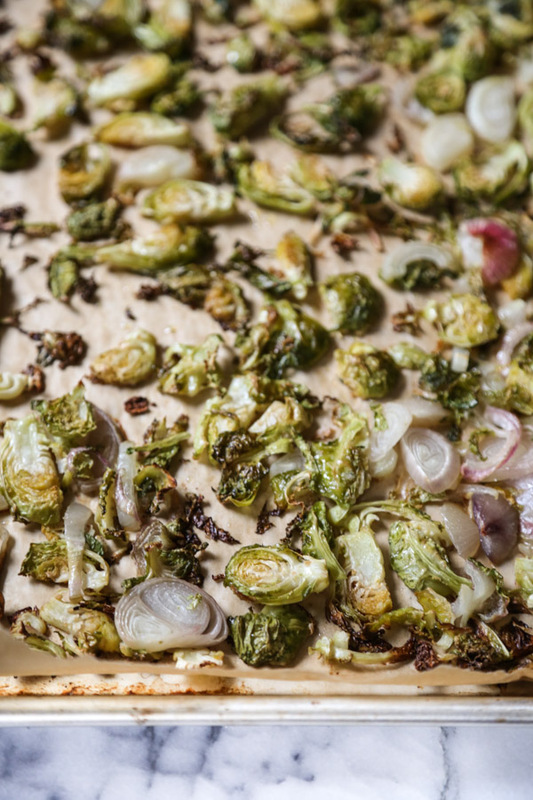 Toss the Brussels sprouts and shallots with 1 tablespoon olive oil and ½ teaspoon salt on a parchment lined baking sheet. Roast in the oven until lightly browned, 25 minutes. Set aside to cool. Meanwhile, in a small lidded saucepan, bring 2 cups of water, the quinoa and ½ teaspoon salt to boil. Cook for 15 minutes, until the liquid is absorbed. Set aside uncovered to cool. 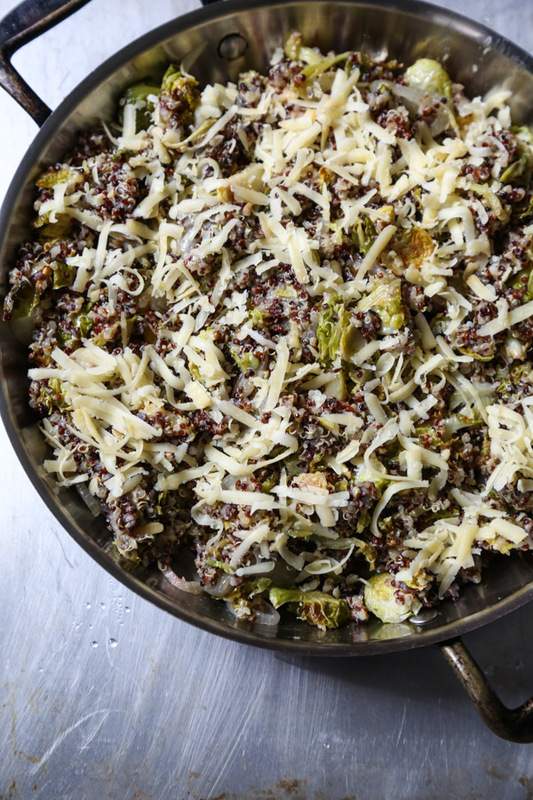 In a large mixing bowl, combine the cooled sprouts, quinoa, egg, ½ teaspoon salt and 1 cup cheese. Transfer to the prepared dish and spread in an even layer. Top with the remaining cheese. Bake until the cheese has begun to brown, 15 minutes. Serve warm or at room temperature. First of all, this recipe is FANTASTIC! We can’t wait to taste the delicious flavors and the great texture this one has. And we totally get the cheesy omelets:) Panos’ grew up with eggs from their own family’s hens, they still have some in Evia. So the eggs are organic, fed with GMO-free corn and wheat and they taste amazing. His mom used to make omelets all the time and when you try those…you’re in heaven. Regarding the NY food community, sounds like you had a blast! :) So many foodies gathered in one place must be amazing, as long as they all keep a positive attitude! From your description we think that was the case in that one, right? We’ve also seen some posts about Nicaragua on twitter, and can’t wait to learn about your trip there! Thanx for the yummy idea Phoebe! Hugs from both of us! Yes, you mentioned it in a post for yemista, we remember! :) Evia has LOTS of hidden treasures. Unfortunately most of the island is underdeveloped (in a bad sense) on how to receive and help a tourist in contrast to the Cyclades islands, Rhodes, Corfu etc. 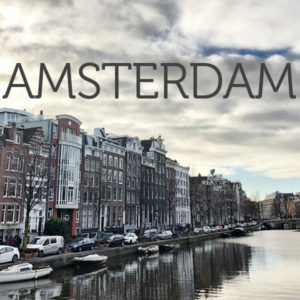 Hopefully this will change at some point with the new generation getting involved in the tourist industry. 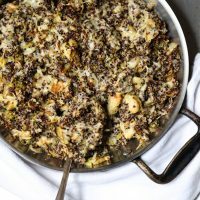 What is the quantity of quinoa? Guessing one cup? I just picked up some Five Brothers Smoked Cheddar on the weekend at a Farmers Market and I think I will be making this!